Ever been at a picnic, smoking a fantastic cigar and need to put it down but only see wet grass or a table to rest it on? How about when you are on the 5th tee box and you try to complete the balancing act of putting your cigar on the ball washer? Never again will these problems ever face you with the awesome CigarPlace Cigar Siesta. Made from the finest of aircraft grade aluminum in a single billet, not from different castings, this accessory is not only extremely functional but also unbelievably well-made. 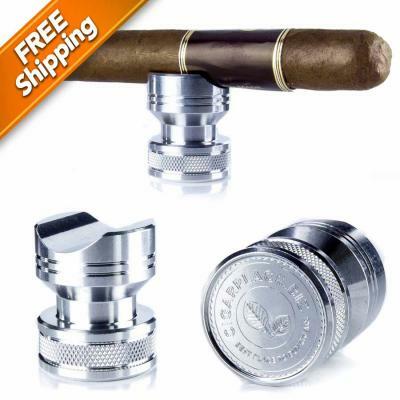 Available in black, polished, 24KT gold plated, and a two-tone finish, this will look great in those cigar shots you post on Instagram. There is also a VIP version, but no amount of money or sweet-talking your rep will help you get your mitts on that one. Measuring in at 1.25” across and 1.5” high, this small accouterment takes up no room in your pocket.